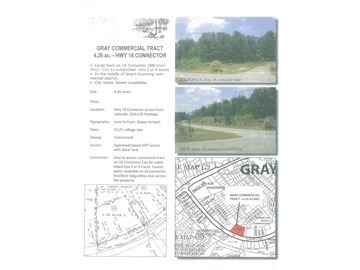 Remarks at 0 Gray, GA - Large 4.26 acre commercial tract on 18 connector (Bill Conn Pkwy) directly in the middle of Gray! Can be subdivided into 3-4 commercial lots. City water/sewer avail. 558.61' frntge. building & office sites already sit across from prop. Zoned c-3. approved/paved dot access w/ decel lane already constructed.